The Mason County Commission recently gave members of the Battle Days committee a $1,000 donation towards the annual Battle Days festival. POINT PLEASANT — The Mason County Commission recently gave donations towards two community festivals. Representatives for both The Mothman Festival and the Battle Days Festival were given a check donation of $1,000. Ed Cromley, member of the Battle Days committee, discussed with commission a few of the highlighted events of Battle Days which will begin Friday, Oct. 6 and end Sunday, Oct. 8. Cromley said on Friday of the festival local school children will be in attendance and will be able to meet reenactors portraying Chief Cornstalk, Daniel Boone, and Ann Bailey. In the evening, the lantern tour will be held at 7:30 p.m. at Tu-Endie-Wei State Park. He explained on Saturday members of the Sons of the Revolution (SAR) will be making apple butter. Also, at 11 a.m. the Battle Days parade will be held on Main Street. The theme this year is “Battle For…” Also, there will be performances by the Elementary School Chorus including the Point Pleasant Junior High Choir and the Point Pleasant Intermediate School Choir as well as the Pipes of St. Andrews. In the evening, Cromley explained festival goers will be able to spend an evening with the Newmans at the Mansion House from 7-9 p.m. and at 8 p.m. a Colonial Ball will be held at the Sacred Heart Catholic Church. Cromley commented those who attend the ball do not have to dress in colonial attire, but are welcome to if they wish. On Sunday at 2 p.m., Cromley said a memorial service will be held and wreaths will be placed in honor of those who gave their lives during the original battle of the American Revolution. Cromley commented he would like to see more local folks come out and enjoy the Battle Days Festival this year. In other business, the commission discussed a company who sets up county websites, the placement of fire hydrants, and the possibility of amending an ordinance regarding dilapidated properties. The commission approved to hire Benjamin Q. Turner to the position entry level Deputy Sheriff and Matthew K. McCormick to the position of entry level Deputy Sheriff at the Mason County Sheriff’s Office. The commission approved to pay $6,250 of the $12,500 total for a software system at the Sheriff’s Office. The Sheriff’s Office will be paying the other the $6,250. 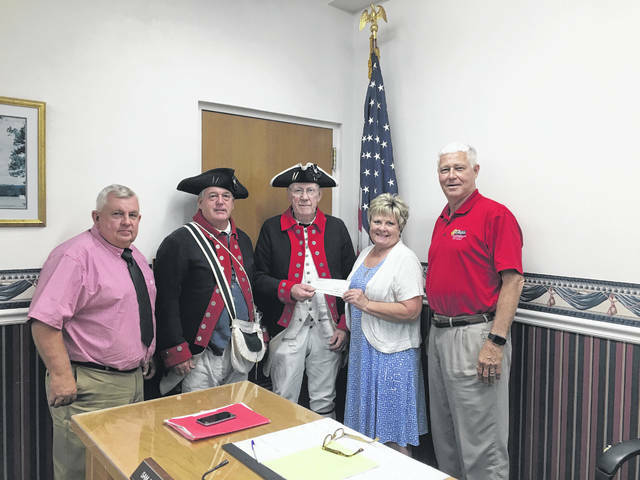 https://www.mydailyregister.com/wp-content/uploads/sites/24/2018/09/web1_0926.Commissioners.jpgThe Mason County Commission recently gave members of the Battle Days committee a $1,000 donation towards the annual Battle Days festival.